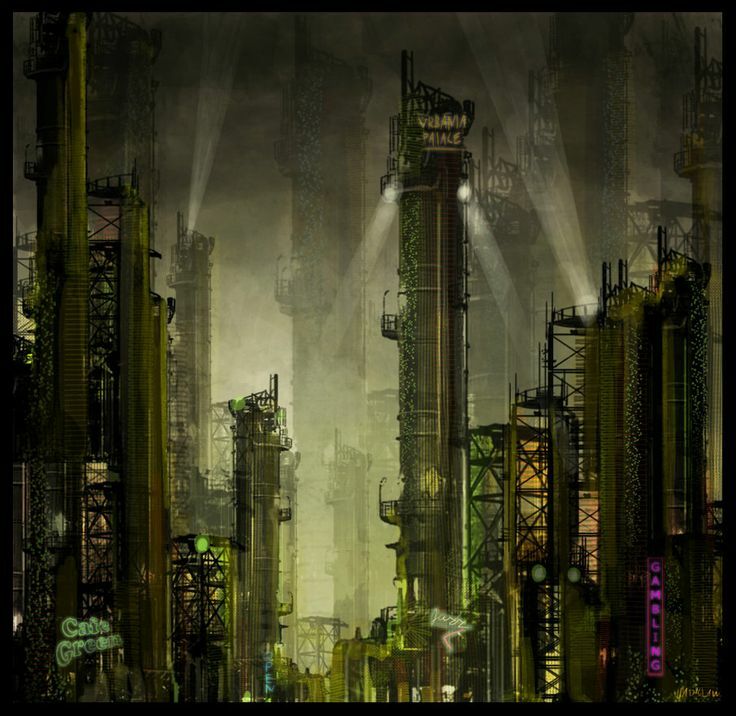 The world that came to be known as Golgotham was settled – as far as the Imperium's patchy and unreliable records can tell – as a mining and manufacturing planet nearly 14,000 years ago. In its purpose, little has changed in the ensuing millennia. Encrusted with manufactories, processing facilities and refineries; and pocked with mines, docks and launches, little of the surface is visible. Nothing would be familiar to the early settlers: the oceans have been reduced to shrunken chemical sludge-ponds, the mountains razed to rubble, the topography churned and devoured by the ravenous demands of the Imperium. The great urban developments – combined housing and factory blocks known as hive-cities – have swelled and proliferated to form great carbuncles that far overtop the lost mountains of ancient times, after which many are named. Sections of these ever-growing hive-cities have expanded, collapsed and broken out into divided city-spires, each building on the ruins of those that came before. Groups, or 'Clusters' of hive-cities that sit closely in geographical terms form interconnected and entwined structures as their roads, tunnels and flight paths form physical networks that mirror the electromatiic, telegraphic and psychic communication networks. Between these clusters are the vast deserts of industrial ash that cover the surface of the planet with a mobile, corrosive skin. Over this desert lies a cloud layer of airborne pollution, so that the great spires of the city hives rise from a drifting mist of tainted vapour like islands out of the sea. Despite its environmental decline, Golgotham remains productive; and thus of importance to the Imperium. Its natural resources long-depleted, the waste-heaps of previous generations have become a new source of riches. Indeed, the populace, high-born and low alike, are united by the necessity of reclaiming everything – from the food they eat to the air they breathe – from the accumulated wastes of the declining, exhausted world. The planet lives by dint of autocannibalisation; and it is wholly reliant on imported or synthetic nutrition. As with hive cities across the Imperium, each incorporates numerous factory-clusters dedicated solely to converting used organic matter – all organic matter – into synth-food. Real food is an expensive luxury for the most prestigious and affluent aristocrats; and little more than a myth to the bulk of the hive-dwellers.